It was a great game. Yes, that was probably ball four to Dunn in the eighth inning, but let me back up. The eighth was very nearly it for the Giants. It was a tight game, and the mistakes that Medders make against to Nieves were complicated by the walk to Nick Johnson by Affeldt. Wilson coming in and walking Zimmerman just seemed like the death knell for 300. It was excruciating. With the weather and the early start, only 5,000 people made it to the game, but each and every one of them was glued to this game like it was game seven of the World Series, and this was the bottom of the ninth. With the score close,and Johnson’s win hanging in the balance, even the Nationals were rooting for Wilson to retire Adam Dunn. Dunn’s been lethal this year with the bases juiced, with a grand slam in five at-bats, plus a total of eight RBI. 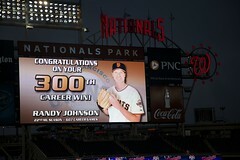 But there we were, with a full count, and Randy Johnson’s 300th win on the line. A walk, and that’s the ballgame for most of the fans still sitting in the rain. A hit, and that’s the ballgame. Strike 3 is pretty much the only option. Wilson wound up and fired it in there. A long pause. It was low, but Dunn made the mistake of showing up the home plate umpire, and chucking his bat toward the dugout and started walking. The umpire took a stutterstep backwards and rung him up, strike 3. Dunn made a show of arguing, but it was no use. The Giants went back to the dugout, and ran up three runs on Joel Hanrahan in the ninth, making the rest academic. 300 wins. The only regret that I have about the game was that there was no curtain call for Johnson. The crowd was on their feet after each inning, but a final thank you would’ve been welcome. I’m told Johnson was eloquent and effusive in the press conference, and I’m sure of it. Johnson commands respect on and off the mound, and his grace is not surprising, but to be respected. If you look at the current list of pitchers in pursuit of 300, only Andy Petitte is the only one with half a shot, which is hard to imagine. No one else, within a generation, is close to the big 300, at least, not close enough to be assured of it. I’m glad to have been there tonight, and I’ll put my scoresheet up on the wall with what’s left of my rainsoaked ticket. I’m sorry, but this is a dreadful post. Dunn did not ‘show up’ the home plate umpire. He flipped his bat away after taking ball four. Brian Wilson’s fastball was at least three inches low. It was not a borderline pitch; it was an ankle-high fastball. Adam Dunn worked a solid at bat and should have tied the game. As a baseball fan, I think it’s great that Randy Johnson, the best left-handed pitcher of my lifetime, has won 300 games. I think it’s poetic that he won his 300th game against his original organization. It’s a good day to be the Big Unit. But it’s a bad day to be a DC baseball fan. The umpire gave Randy Johnson a gift by preserving a lead at the expense of the Nationals. Why should we, as an allegedly major league city, accept this. The team was hosed. Bad calls happen, true, but that call was unconscionable. We should not celebrate it. We should stand up and shout that the Nationals are a real baseball team and deserve to be treated as such. And we should insist that local bloggers on the sports beat actually cheer for the home team. In five days, I would have cheered for Randy Johnson to throw a dominant outing and win his 300th. I look forward to seeing his plaque hang in the Hall of Fame in five years. I just wish the Nats hitters had turned a few of his 88 mph fastballs into mullet-straightening rockets. I love the Nats, I do, but let’s be honest: we’re a AAA franchise playing in the bigs. I’ll run down the list of bungles and fuckups if you like. The patient Dunn worked a good atbat against Wilson, but you learn early to let the umps make the call before you assume they’ll be on your side. The call was bad, that was a ball, not a strike, however, from where I was sitting, like two rows off the dugout, there had been a called ball two pitches earlier that was almost 100% a strike. It was a makeup call, not a reaction to Dunn. Right decision? eh… Gripping baseball? totall.